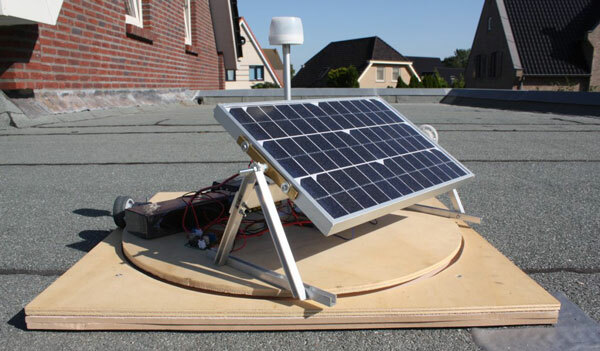 When Sjoerd Brandsma entered the 2012 Renesas Green Energy Challenge, he wanted to create a fun project that would take advantage of his experience at a company that heavily uses GPS. Brandsma, who lives in Kerkwijk, The Netherlands, has worked as a software engineer and is currently an R&D manager at CycloMedia, which produces 360° street-level panoramic images with geographic information system (GIS) accuracy. Ultimately, Brandsma’s Sun Chaser project won third prize in the Renesas Green Energy Challenge. The Sun Chaser is an energy-harvesting system that automatically orients a solar panel to face the sun. The following article excerpt describes the GPS reference station and evaluation board in greater detail. 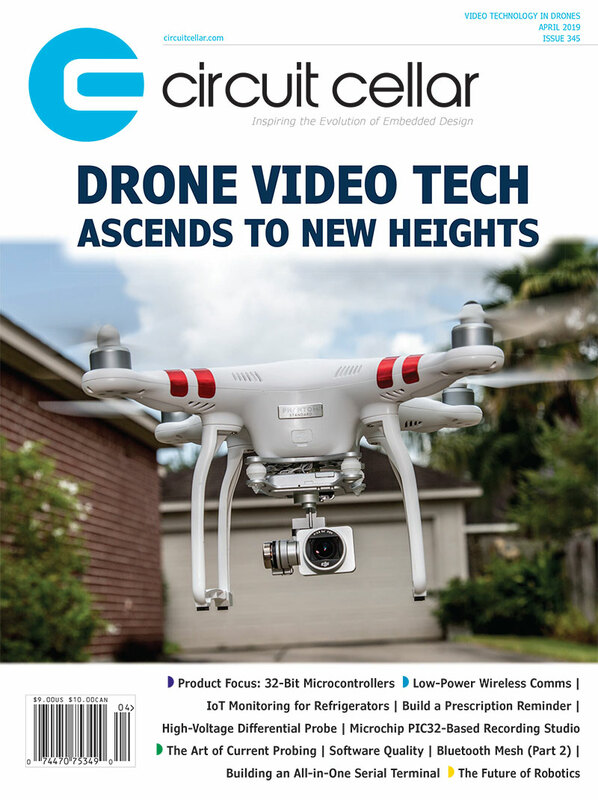 The issue with Brandsma’s full article is available online for membership download or single-issue purchase. Whenever you want to know where you are, you can use a GPS receiver that provides your position. A single GPS receiver can provide about 10 to 15 m (i.e., 33’ to 50’) position accuracy. While this is sufficient for many people, some applications require positioning with significantly higher accuracy. In fact, GPS can readily produce positions that are accurate to 1 m (3’), 0.5 m (18”), or even 1 to 2 cm (less than 1“). A technique called “differential GPS” can be used to achieve higher accuracy. The GPS reference station should always be located at a position with a broad sight. In some situations it can be difficult to provide a decent power supply to the system. When regular power isn’t available, a solar panel can power the GPS reference station. My Sun Chaser GPS reference station uses a 10-W solar panel connected to a 12-V battery to provide enough power. To increase the energy harvesting, the solar panel is mounted on a rotating disc that can be controlled by a DC motor to point in the desired direction. A stepper motor controls the solar panel’s “tilting.” Photo 1 highlights the main components. 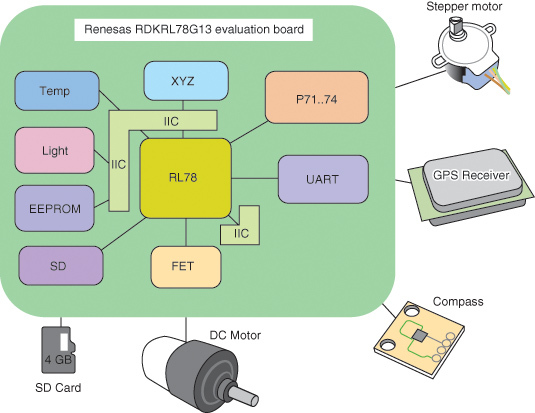 The RDKRL78G13 is an evaluation and demonstration tool for Renesas Electronics’s RL78 low-power microcontrollers. A set of human-machine interfaces (HMIs) is tightly integrated with the RL78’s features. I used several of these interfaces to control other devices, read sensors, or store data. Most of the system’s hardware is related to placing the solar panel in the correct position. Figure 1 shows the top-level components used to store the GPS information and position the solar panel. 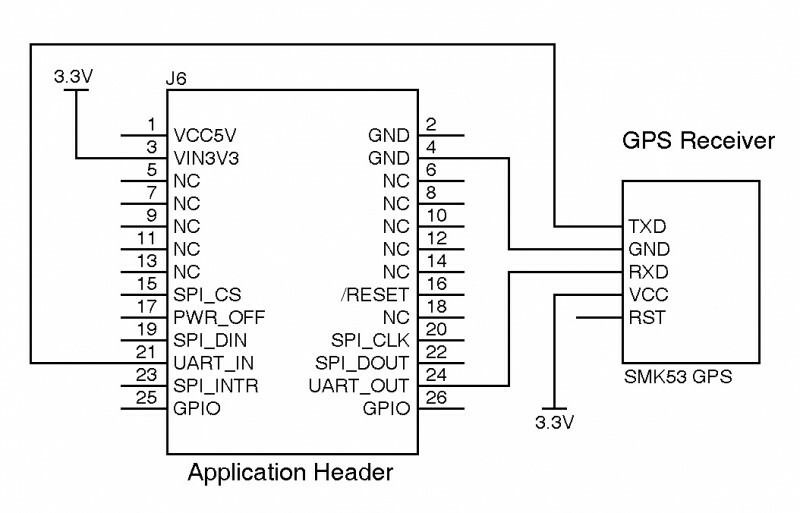 Figure 1: The Sun Chaser’s components include a Renesas Electronics RDKRL78G13 evaluation board, a GPS receiver, a stepper motor, and an SD card. The RDKRL78G13 evaluation board has an on-board temperature and light sensor. Both sensor values are stored on the SD card. The on-board light sensor is used to determine if rotating/tilting makes sense (at night it’s better to sleep). For this project, the temperature values are stored just for fun so I could make some graphs or do some weather analysis. A micro-SD memory card slot on the RDKRL78G13 evaluation board provides file system data storage. I used it to store all incoming data and log messages using the FAT16/FAT32 file system. The on-board Renesas Electronics RQK0609CQDQS MOSFET controls the DC motor that rotates the evaluation board. The DC motor can be controlled by applying a PWM signal generated from one of the RL78’s timers. The MOSFET is controlled by the RL78’s TO05 port and powered from the 12-V battery. A PWM signal is generated on TO05 by using Timer4 as a master and Timer5 as a slave. It’s only necessary to rotate clockwise, so additional hardware to rotate the platform counterclockwise is not required. A digital compass is needed to determine the evaluation board’s rotated position or heading (see Figure 2). The Honeywell HMC5883L is a widely used and low-cost compass. 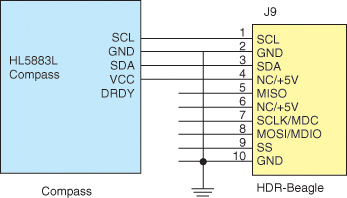 This I2C-based compass has three-axis magnetoresistive sensors and a 12-bit ADC on board. It can read out values at a 160-Hz rate, which is more than enough for this project. Figure 2: A Honeywell HMC5883L digital compass verifies the evaluation board’s rotated position or heading. The compass uses the RL78’s IICA0 port through the Total Phase Beagle debug header, which is mounted on the RDKRL78G13 evaluation board. The Beagle analyzer provides easy access to this I2C port, which increases the flexibility to change things during prototyping. The HMC5883L compass turned out to be a very sensitive device. Even the slightest change in the hardware setup seemed to influence the results when rotating. This meant some sort of calibration was needed to ensure the output was consistent every time the system started. [Brandsman’s full article descibes how how the HMC5883L can be calibrated. It’s important to know that every time the system starts, it makes a full turn to calibrate the compass. A GPS module must be connected to the system to provide the system’s current location. I wanted the GPS module to be inexpensive, 3.3-V based, and have an easy and accessible interface (e.g., UART). Figure 3 shows a schematic of a Skylab M&C Technology SKM53 GPS module, which is based on the MediaTek 3329 GPS receiver module. This module supports NMEA messages and the MTK NMEA Packet Protocol interface to control things such as power saving, output message frequency, and differential global positioning system (DGPS). Unfortunately, the 3329 receiver can’t output “raw” GPS data (e.g., pseudorange, integrated carrier phase, Doppler shift, and satellite ephemeris), which would significantly improve the GPS reference station’s capabilities. Due to budget and time limitations (it takes some more software development effort to handle this raw data), I didn’t use a receiver that could output raw GPS data. Figure 3:A Skylab M&C Technology SKM53 GPS receiver obtains the system’s current location. The SKM53 GPS receiver is connected to the RL78’s UART2. All data from the GPS receiver is stored on the SD card. As soon as a valid GPS position is received, the system calculates the sun’s position and moves the platform into the most ideal position. A compact stepper motor is needed to tilt the platform in very small steps. The platform had to be tilted from fully vertical to fully horizontal in approximately 6 h when the sun was exactly following the equator, so speed wasn’t really an issue. I wanted to do very fine tilting, so I also needed a set of gears to slow down the platform tilting. I used an inexpensive, easy-to-use, generic 5-V 28BYJ-48 stepper motor (see Figure 4). According to the specifications, the 28BYJ-48 stepper motor has a 1/64 gear reduction ratio and 64 steps per rotation (5.625°/step) of its internal motor shaft. An important consideration here is that you don’t want to retain power on the stepper motor to keep it in position. This particular stepper motor has some internal gears that prevent the platform from flipping back when the stepper motor is not powered. The stepper motor can be controlled by the well-known ULN2003 high-voltage high-current Darlington transistor array. The ULN2003 is connected to P71-P74. Each of the ULN2003’s four outputs is connected to one of the stepper motor’s coils. When two neighbor coils are set high (e.g., P72 and P73), the stepper motor will step in that direction. When it comes to solar panels, you can build your own panel out of individual solar cells or buy a fully assembled one with known specifications. I used a no-name 10-W solar panel. The size (337 mm long × 205 mm wide × 18 mm high) was acceptable and it delivered more than enough energy. I used a charge controller to protect the battery from overcharging and to prevent it from supplying power to the solar panel at night. Like solar panels, many charge controllers and battery protectors can be used in such a system. I chose the lazy approach: Just take one off the shelf. The CMP12/24 charge controller is specially designed for small solar systems. It has a stabilized 12-V output, which is taken from the connected battery. It can handle up to 12 A of charging or load current and, according to the specifications, it consumes about 20 mA of quiescent current. There is some room for improvement, but it worked for my project. I had some 7805 voltage regulators lying around, which I figured could do the job and supply just enough power when the system was starting up. However, when it comes to power saving, the 7805 is not the way to go. It’s a linear regulator that works by taking the difference between the input and output voltages and burning it up as wasted heat. What I needed was a switching regulator or a buck converter. I used a National Semiconductor (now Texas Instruments) LM2596. Note: The LM2596 is made by several companies and is available in inexpensive, high-quality modules (most cost a little more than $1 per converter). These ready-to-use modules already have the necessary capacitors, diodes, and so forth on board, so it’s really a matter of plug and play. I used a lead acid RT1219 12-V 1.9-AH battery for power storage. You can use any 12-V battery with sufficient capacity. Editor’s Note: Check out other projects from the 2012 Renesas RL78 Green Energy Challenge. This entry was posted in CC Blog and tagged GPS, MediaTek, MOSFET, Renesas, RL78, solar, solar energy, solar panel, stepper motor by Circuit Cellar Staff.